One piece, seamless double-wall polyethylene construction and foamed-in-place polyurethane insulation ensures years of dependable service, enhances temperature retention and prevents liquids from seeping between walls. 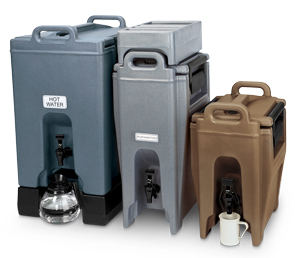 Ultra Camtainers® will keep beverages hot or cold for hours and are perfect for front and back-room use. A recessed large faucet and wide opening accommodates larger cups. Interlocking allows stackable Camtainers. Sanitary Easy to fill or clean.